When it comes to maintaining your RV, most travelers will remember things like oil changes, battery upkeep, and repairing general wear and tear on various parts and systems inside their mobile home. However, one of the most crucial elements to pay attention to is the seams of your RV, particularly on the roof. Over time, bumps in the road and other conditions can cause these seams to crack and open up, leading to leaks inside your motorhome. Fortunately, it’s relatively easy to manage these issues, provided that you have the best caulk for RV exteriors. As far as maintenance goes, resealing various cracks in your RV’s shell is much less of a hassle than most other jobs you’ll have to do. So, with that in mind, let’s take a look at the best caulks and how they can enable you to keep your mobile home in tip-top shape all year round. 1. 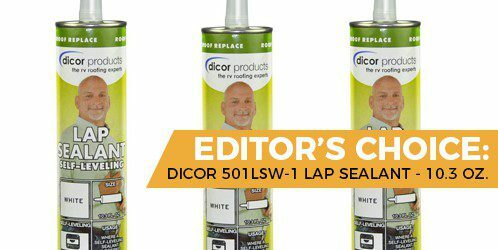 Dicor 501LSW-1 Lap Sealant - 10.3 oz. 3. Geocel 28100V Pro Flex Crystal Clear RV Flexible Sealant - 10 oz. As I’ll discuss further down in the buyer’s guide, you can’t just buy any type of caulk for your RV and call it a day. Instead, you need to find one specifically designed for the materials you’ll come across so that the caulk will stay in place for years, not months. Dicor is one of the best brands out there, partly because it’s designed for RVs, meaning that you can feel confident when buying it. Let’s see what it can do. Although the plastic sheeting on your mobile home is going to be the primary material you have to consider when picking out an exterior caulk, it’s not the only one. Vents and other seams along your RV’s roof can have different materials, such as wood, vinyl, or metal (i.e., aluminum). Dicor is perfect because it creates a strong bond with everything, meaning that you won’t have to worry about replacing the caulk for a long time. It will adhere quickly and efficiently, and it’s formulated to be safe with most RV exterior sheeting (EPDM or TPO). When looking at the best caulk for RV exteriors, you’ll notice two primary phrases - self-leveling and non-sag. It’s critical that you get both because they are designed for horizontal and vertical surfaces, respectively. If you use a horizontal caulk on a vertical seam, then it will start to drip before it dries, leading to potential problems as some areas may not be covered, while others will have large balls of caulk covering them. In this case, the Dicor is meant for roofs, so don’t try and use it on windows or anything else on the sides of your mobile home. I appreciate that this brand is so well regarded for its adhesion to RV materials and that the founder recognizes the need for strong bonds for extra durability. This caulk is easy to apply, and it will last longer than most of its competitors. Ideally, you will be able to find a caulk that works on both horizontal and vertical surfaces. However, in some cases, having two individual versions may be best since you probably won’t be able to recaulk your whole RV with just a single tube. Our final caulk is made for household roofs, so be aware that it’s not designed for EPDM or TPO surfaces. However, that being said, this is one of the most durable and reliable caulks I’ve seen. Because this product is made for roofing, it can work in a variety of conditions. If you plan on caulking during your travels (meaning you can’t let it cure for days), then this kind of caulk may be ideal. This product will adhere to most materials with ease, regardless of if they are wet or frozen. This feature ensures that you can apply it whenever necessary. If you plan on traveling during the coldest months of the year, you can rest easy, knowing that the caulk won’t freeze and crack because of the frigid temperatures. Overall, this is some of the most resilient stuff I’ve seen. I like this caulk if you plan on doing any roofing, but when it comes to RVs, it may or may not be suitable for your mobile home. This product is designed for roofing materials, so plastic like EPDM may cause problems. That being said, this caulk is highly effective and durable, so it can work for longer than most other non-RV versions. I recommend it only if you have to seal your RV outside and the weather won’t cooperate. When it comes to roofing, this caulk is the best. However, when talking about the best caulk for RV exteriors, it can be a little spotty. Ultimately, use it at your own risk, since there’s no guarantee it will adhere correctly. Overall, when choosing the best caulk for RV exteriors, you’ll want to find versions that are formulated for mobile homes. While you can use generic caulk (as long as it’s flexible), these kinds are going to hold up much better to the wear and tear of the road. The way that this caulk dries is both a blessing and a curse. At first, the transparent material will be extra shiny, meaning that it will be highly noticeable if you’re paying attention. For people who don’t want to draw attention to their work, this may be an issue. Thankfully, though, after a few weeks, the shine will dissipate, and the caulk will still be clear, so it will be much harder to detect. Since this caulk is rated to last for over 20 years, a few weeks of high visibility is a small price to pay for a clear coating. Although I don’t recommend caulking when your RV is wet (or in freezing conditions for that matter), it’s nice to know that this material is designed to work in both situations. The real reason why it will come in handy is if you have to caulk on the road, meaning that you can’t let it cure for the few days necessary to get the best results. Overall, since this caulk is rated for RVs, it will be suitable for most mobile homes. I like that it’s easy to apply and that it’s weatherproof, even when putting it on. This caulk can adhere to a lot of materials, but not all of them. If you have any fiberglass on your RV, it won’t work, so keep that in mind. Also, if the shine factor does bother you, then I suggest finding something else. As I mentioned above, most RV caulks are formulated to work on either horizontal or vertical surfaces. This particular version from Sashco is not made for RVs specifically, but it’s one of the stickiest caulks you can find, meaning that it should work for any application. Let’s see what it can do. Technically speaking, this caulk is only formulated for indoor use. However, considering that you can use it in the bathroom and other places where it will take a beating, it’s more than sufficient for outdoor use as well. Cleaning chemicals, water, and other elements are no match for this caulk, and it will adhere to almost any surface, including porcelain and plastic. It’s not rated explicitly for EPDM or TPO surfaces, but it should be okay. Because this caulk is an elastic polymer, it will hold up to the normal wear and tear of life on the road. Unlike silicone caulk that is meant for stationary use, this version will be suitable for almost any conditions you may experience. If you’re not going to buy RV-formulated caulk, this is probably the best option you can find. I like that it’s sticky enough to avoid dripping on vertical surfaces and that it can withstand most elements. The stickiness can be an issue while applying, as it will want to stick to everything, including your hands and the putty knife. Soapy water is a great way to avoid this problem, but you do have to be careful so that the water won’t seep into the cracks and get stuck when the caulk dries. Also, because it’s not made for RVs in particular, this caulk may not last as long as other varieties. Next, we have another RV-specific caulk, so you can feel confident when applying it to the surface of your mobile home. Let’s see how it stacks up against the others. One of the most significant issues that your caulk will experience is UV damage. Since your RV is going to be outdoors for much of its life, all surfaces have to be treated accordingly, lest you have discoloration or cracking. Thankfully, this caulk is formulated to withstand sun damage, meaning that it will last longer and be more reliable than other varieties. As I discussed with the Dicor Caulk, this version is a self-leveling lap sealant. That means that it’s formulated for RV roofs, so don’t try and use it on the windows or other vertical surfaces. Although this sealant isn’t as well reviewed as Dicor, it’s more than suitable for the RV life. I always recommend caulks that are formulated for mobile home surfaces, and this is a decent offering. There’s not much to dislike about this caulk, although you will have to find a different version of it for all of your vertical surfaces. Also, it may not last as long as high-end caulks like Dicor. Does the caulk work on every fixture and material? I’ve touched on this already, but you will want to pay attention to the materials that the caulk lists specifically. In most cases, caulk is designed to adhere to slightly porous surfaces, such as wood or concrete. If you don’t buy a caulk that is developed specifically for RVs, then keep in mind that it may not adhere as well as one that is. While all of the ones listed here are suitable, those that are formulated for RV materials (EPDM or TPO) are going to work the best. The other thing to keep in mind is that vertical surfaces (non-sag) are different than horizontal (self-leveling), so don’t assume that one caulk will work on all of them. For vertical needs, I highly recommend an extra sticky version that won’t drip easily. Why can’t I just use the silicone caulk that I have lying around somewhere? While you could use standard silicone caulk that you would find in a regular hardware store, be prepared to replace it regularly. The problem with silicone is that it’s not designed to be flexible. Unlike your regular home, an RV moves and shifts while you drive. Thus, you need something that can handle the rigors of the road. Silicone caulk will crack and come apart much faster than other varieties. Should you recaulk or remove old caulk before applying? Whenever applying new caulk, you will want to remove the old stuff first. Yes, it will take longer, but the results will also last for years (assuming you have the right kind), so it’s not a process that you’ll have to repeat soon. To help you expedite the recaulking procedure, I recommend inspecting your RV and marking any cracked areas with either tape or some kind of washable marker. This will help you focus your attention on problem areas and save time overall. Then, before applying the caulk, be sure to clean the surface and let it dry first. Any dirt or grime that remains can affect the adhesion process, and potentially force you to recaulk again sooner rather than later. How long does it take to recaulk an RV? Depending on the number of cracks you have, this process shouldn’t take more than a couple of hours. Here are some tips on how to make sure that you get it right the first time. Cut a smaller opening than you think. Caulk can be notoriously difficult to control, and it can create bubbles or globs if you’re not careful. You will have to fix your lines after caulking. The best way to do it is to have soapy water on your hands so that the caulk won’t stick and create more of a mess. Wipe down the surface afterward. If possible, practice your caulking technique before applying it to your RV. You can use any kind of caulk for this, so don’t waste the good stuff if you’re going to do it. Another thing you have to remember is that even though the caulking process may only be a few hours, you will have to let it cure for a few days to ensure that it won’t crack or come undone. I highly recommend doing it in a covered area as well (i.e., the garage), so that environmental issues such as rain won’t affect the final application. Although most of the caulk on this list is designed for RVs, none of them are quite as reliable or as rugged as the Dicor Lap Sealant. I didn’t list a non-sagging kind for vertical surfaces, but you should be able to find that really easily when shopping for this version. I prefer Dicor because it’s formulated for EPDM and TPO surfaces, and it will bond better than most other caulks out there. Because of this adhesion, you can rely on this caulk to last for years (or decades) to come.